Spinal anesthesia produces intense sensory and motor blockade as well as sympathetic blockade. As opposed to epidural anesthesia, in which medications are instilled outside the dura mater, the goal of spinal anesthesia is to instill the desired medications into the cerebrospinal fluid (CSF). The sensorimotor block produced requires smaller doses of local anesthetics (hence, local anesthetic toxicity is rarely a concern) and is often more dense in character. Although the focus of this topic is subarachnoid block, comparison with epidural anesthesia may be informative. For instance, brief periods (less than 24 hours) of postoperative analgesia can be facilitated by adding an opioid to the local anesthetic injected into the cerebrospinal fluid. Prolonged postoperative analgesia is best ensured by insertion of an epidural catheter, using an opioid and local anesthetic combination infused continuously over the first few postoperative days. See the table below for a comparison of subarachnoid and epidural anesthesia. a Onset varies with choice of local anesthetic. Advantages include avoidance of general anesthesia and the airway management concerns that accompany general anesthesia. However, that is not to suggest that spinal anesthesia is always the best course in a patient likely to have difficulties with endotracheal intubation. All patients with difficult airways, no matter what anesthetic plan is chosen, should have a well thoughtout plan for airway management, should it be needed. Additional benefits may include reducing the metabolic stress response to surgery, reduction in blood loss, decrease in the incidence of venous thromboembolism, reduction in pulmonary compromise (particularly in patients with advanced pulmonary disease), and the ability to monitor the patient’s mental status. Strong contraindications include patient refusal, lack of patient cooperation, difficulties with positioning, and increased intracranial pressure. Other contraindications include situations that require some risk-benefit analysis include hypovolemia, coagulation disturbances, stenotic valvular disease, bacteremia, and infection at the site of needle insertion. Spinal anesthesia has also been noted to result in symptomatic deterioration in patients with multiple sclerosis. Patients with chronic low back pain may decline spinal anesthesia out of concerns for increased low back pain. Performing spinal anesthesia in patients with degenerative lumbar spine disease or a prior history of lumbar surgery may prove technically difficult, but these are not necessarily contraindications. Although one-shot injection techniques are the norm, continuous spinal anesthesia has enjoyed periods of popularity while also being demonized. In the early 1990s, spinal microcatheters (27-G) were introduced but were followed by an increased incidence of postoperative cauda equina syndrome. In cases in which cauda equina syndrome developed postoperatively, microcatheters were used; in response to an unsuitable rise in anesthetized dermatomal levels, unusually large of doses of local anesthetics (usually lidocaine) were administered to effect a sufficient spinal anesthetic. What may have happened was that insufficient turbulence was created through injection through the microcatheter, the local anesthetic pooled distally in the lumbar intrathecal space (below the natural lumbar lordosis), and with repeated local anesthetic doses, administered in hopes of advancing the dermatomal level of local anesthetic effect, toxic local anesthetic levels were created in the region of the cauda equina. With any sympathectomy, blood pressure is expected to decrease secondary to increased venous capacitance and decreased peripheral vascular resistance. Incidence of hypotension is estimated at 35%. Bradycardia secondary to blockade of sympathetic-mediated cardioaccelerator nerves (T1-T4) may contribute to decreased cardiac output. The incidence is around 13%, and bradycardia is more likely to be found in children or adults with baseline heart rates less than 60 per minute and may be reversed with the anticholinergic medications atropine or glycopyrrolate. Tidal volumes tend to remain unchanged during subarachnoid block, although expiratory reserve is diminished secondary to paralysis of abdominal musculature. The gut is contracted due to unopposed parasympathetic activity. Hyperperistalsis may contribute to nausea and vomiting but, perhaps more commonly, nausea and vomiting are indicators of hypotension. Renal function is preserved. The distal shape of spinal needles determines whether they cut or spread dural fibers. 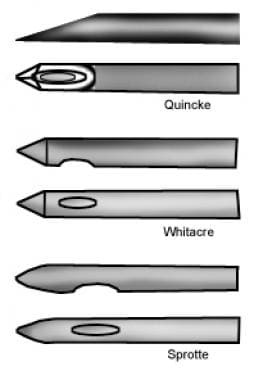 Quincke needles that cut the dura are believed to be associated with an increased incidence of postdural puncture headache and have fallen into disfavor when compared to the pencil-point Whitacre or Sprotte needles (see the image below). The tip of a cutting-type spinal needle known as a Quinke needle is compared to two pencil-point spinal needles, the Whitacre and Sprotte needles. The latter two needles have a lower incidence of associated postdural puncture headaches. Continuous spinal techniques require the use of larger Tuohy needles that permit catheter-through-needle procedures. Although hypotension and bradycardia are most likely to occur soon after performance of the subarachnoid block, the vasodilated state persists throughout the spinal anesthetic. Hence, blood loss secondary to the surgical procedure must be closely monitored and replaced with a balanced crystalloid or colloid solution or packed red blood cells if the blood loss is severe. Major complications with subarachnoid block are rare. Should local anesthetic reach the brainstem, the patient may develop dysphonia, dyspnea, progressive upper extremity weakness, experience loss of consciousness and loss of airway protection, and require definitive airway control. Hypotension, bradycardia, and cardiac arrest are also risks. Respiratory arrest may be secondary to hypoperfusion of brainstem respiratory centers. Pupillary dilation in the setting of loss of consciousness suggested the diagnosis of "total spinal." Once the airway is controlled and the patient mechanically ventilated, attention should be directed towards addressing significant changes in heart rate or blood pressure as described previously. Total spinals tend to be short in duration; not uncommonly, once the surgery is complete the total spinal has resolved, the patient’s mentation has returned, and the patient may be extubated. Concerningly, patients under spinal anesthesia are more sensitive to sedation and are at increased risk of respiratory depression. Caplan et al published a review of otherwise healthy patients who experienced cardiorespiratory arrest. Despite being otherwise healthy and having witnessed cardiac arrest, outcomes were devastating. Many died and most of the remainder were discharged to assisted living settings with persistent neurologic complications. This altered sensitivity to sedative medications was later verified. The purported mechanism was loss of peripheral input into the brainstem center responsible for maintaining arousal (the reticular activating system). Other complications include direct injury to spinal nerves, postdural puncture headache, neuraxial hematoma, meningitis or neuraxial abscess, adhesive arachnoiditis and cauda equina syndrome, and transient neurologic syndrome. Because these patients become vasodilated, they are at risk for hypothermia; active warming measures should be employed on these patients just as they are in patients receiving general anesthesia. The hypothermia is due to vasodilation as well as loss of thermoregulation. The incidence of postdural puncture headaches after spinal anesthesia is about 1%. Because of the larger needles used for epidural anesthetics, the incidence of postdural puncture headaches (should the dura mater be pierced) is higher with epidural anesthetics. Postdural puncture headaches are associated with leakage of cerebrospinal fluid. They tend to be intense, positional (worse when upright), and often localized to the occipital region and neck. Diplopia (thought secondary to traction on the sixth cranial nerve) and blurred vision may be reported. The frequency is increased in women, younger patients, parturients, and obese patients. The incidence of postdural puncture headaches with spinal anesthesia has been decreasing recently due to changes in the shape of spinal needles. Previously, the needles were beveled, but now they tend to be shaped like a pencil point. The rent in the dura is associated with less leakage of cerebrospinal fluid. Much attention has been given to considering whether spinal (or epidural) anesthesia is appropriate in patients receiving anticoagulants. The American Society of Regional Anesthesia has led educational efforts in this regard. Whether regional anesthesia can be safely undertaken while the patient is anticoagulated is a function of the dose of the particular medication and frequency of dosing, whether more than one anticoagulant is being administered concurrently, and the time since the last anticoagulant dose. In general, as the patient receives more medications with bleeding potential, the lower the platelet count (eg, less than 75-100 per mm3). In the presence of hepatic or renal disease or other conditions that affect coagulation, any neuraxial technique becomes more contraindicated. Obviously, analysis of coagulation function is necessary in many of these patients. See the table below. Minidose unfractionated heparin is not contraindicated. However, it is best to time performance of the block when the heparin effect is minimal. Timing of the neuraxial procedure and dosing of LMWH is extremely important, as is the dose of LMWH. Needle placement should occur at least 10–12 hours after an LMWH dose. Neuraxial procedures should be delayed for 24 hours when the patient is receiving larger LMWH doses: enoxaparin 1 mg/kg every 12 hours, enoxaparin 1.5 mg/kg daily, dalteparin 120 U/kg every 12 hours, dalteparin 200 U/kg daily. A bloody spinal tap should not cause cancellation of the surgery but should delay administration of LMWH by 24 hours. Patients administered LMWH within 2 hours of surgery should not have a neuraxial technique. Oral anticoagulants or antiplatelet drugs administered concurrently increase risk. Discontinue thienopyridines: 7 days for clopidogrel; 14 days for ticlopidine. Avoid neuraxial techniques after GP IIb IIIa inhibitors until adequate platelet function established. Test platelet function with thromboelastography. Neuraxial anesthesia is not recommended. Local anesthetics are the principal agent used to achieve spinal anesthesia (see the table below). a Epinephrine concentration 1:200,000, or 5 µg/mL. b See discussion about current concerns with lidocaine spinal anesthesia. The principal sites of effect are the spinal cord and spinal nerve roots. Reabsorption of the injected agents from the cerebrospinal fluid into the systemic circulation limits the duration of effect. Vasocontrictor agents such as epinephrine may delay reabsorption and prolong local anesthetic effect. Baricity is defined as the ratio of densities of two solutions. In this situation, the density of the local anesthetic solution is compared to the density of cerebrospinal fluid. Solutions that are hyperbaric relative to the density of cerebrospinal fluid tend to sink more than isobaric or hypobaric solutions. The local anesthetic chosen is based on the anticipated duration of surgery. Concerns about lidocaine producing transient neurologic syndrome are discussed in Complications. Patient characteristics that influence the duration of local anesthetic effect include height, position when injecting, intra-abdominal pressure, anatomic features of the spinal canal, and pregnancy. Lumbosacral cerebrospinal fluid volumes have been noted to vary remarkably (approximately 30-80 mL) and are definitely decreased during pregnancy. Of all these features, cerebrospinal fluid volume is believed to probably be the most important factor in determining the extent of blockade as well as its time to regression. Opioids are frequently added to local anesthetics. They prolong the duration of anesthesia without remarkably increasing motor blockade or sympathetic blockade and provide postoperative analgesia as well. Major sites of action are the opioid receptors within the second and third laminae of the substantia gelatinosa of the doral horn of the spinal cord. The hydrophilic opioid morphine has a longer and more diffuse duration of effect (6-24 hours) when compared to the lipophilic opioids fentanyl and sufentanil (about 4 hours or slightly more). Side effects of all opioids include respiratory depression, nausea and vomiting, pruritus, and urinary retention. These side effects may be reversed with opioid agonists or mixed agonist-antagonist, but this may reverse analgesia as well. See the table below. In comparison to an epidural technique that can be performed at any level of the vertebral column, spinal anesthetics are always performed below L1 in an adult and L3 in a child to avoid needle trauma to the spinal cord (see the image below). 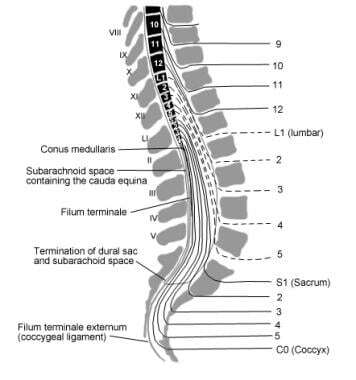 This figure demonstrates the anatomic relationship between the spinal cord terminus, the spinal nerves, and the lumbar vertebrae. Spinal anesthetics should be performed at vertebral levels below the spinal cord terminus. A useful landmark is the line from the top of both iliac crests, which coincides with the L3-L4 interspace. Either a midline or paramedian approach can be used. The patient may be placed in either the lateral decubitus position or sitting up with support from an assistant. Many favor the sitting position because it facilitates more accurate identification of the spinal anatomy. This position is definitely preferred when only dense blockade of the perineal anatomy is needed. However, an advantage of the decubitus position is the ability to more easily sedate the patient. Occasionally, spinal anesthetics are performed in the prone position. The patient is asked to curl his or her back dorsally, opening up the vertebral interspaces. The goal is to inject the chosen medication(s) into the cerebrospinal fluid-filled subarachnoid space. To achieve this, the spinal needle will pass through skin, subcutaneous tissue, supraspinous ligament, interspinous ligament, ligamentum flavum, dura mater, and subarachnoid membrane. See the image below. 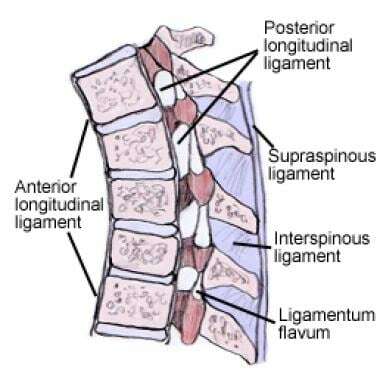 This lateral projection of the lumbar spine demonstrates the ligamentous structures through which a spinal needle must pass before encountering the subarachnoid space. Besides the skin and subcutaneous tissue, the needle will pass through the supraspinous ligament, interspinous ligament, ligamentum flavum, dura mater, and subarachnoid membrane. The correct space is identified by return of cerebrospinal fluid through the spinal needle. See the image below. 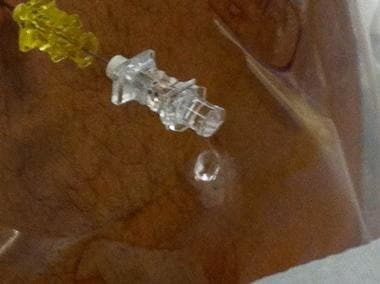 Clear cerebrospinal fluid drips out of the spinal needle, confirming the correct position within the subarachnoid space. Corning JL. Spinal anesthesia and local medications of the cord. N Y Med J. 1885. 42:483. Norris MC, Fogel ST, Conway-Long C. Combined spinal-epidural versus epidural labor analgesia. Anesthesiology. 2001 Oct. 95(4):913-20. [Medline]. Braga Ade F, Frias JA, Braga FS, Pereira RI, Titotto SM. Spinal anesthesia for elective ceasarean section: use of different doses of hyperbaric bupivacaine associated with morphine and clonidine. Acta Cir Bras. 2013 Jan. 28(1):26-32. [Medline]. Hoyle J, Yentis SM. Assessing the height of block for caesarean section over the past three decades: trends from the literature. Anaesthesia. 2015 Apr. 70 (4):421-8. [Medline]. Perlas A, Chan VW. Neuraxial anesthesia and multiple sclerosis. Can J Anaesth. 2005 May. 52(5):454-8. [Medline]. Chattopadhyay A, Maitra S, Sen S, Bhattacharjee S, Layek A, Pal S, et al. A study to compare the analgesic efficacy of intrathecal bupivacaine alone with intrathecal bupivacaine midazolam combination in patients undergoing elective infraumbilical surgery. Anesthesiol Res Pract. 2013. 2013:567134. [Medline]. [Full Text]. Hampl K, Steinfeldt T, Wulf H. Spinal anesthesia revisited: toxicity of new and old drugs and compounds. Curr Opin Anaesthesiol. 2014 Oct. 27 (5):549-55. [Medline]. Freedman JM, Li DK, Drasner K, Jaskela MC, Larsen B, Wi S. Transient neurologic symptoms after spinal anesthesia: an epidemiologic study of 1,863 patients. Anesthesiology. 1998 Sep. 89(3):633-41. [Medline]. Staikou C, Paraskeva A. The effects of intrathecal and systemic adjuvants on subarachnoid block. Minerva Anestesiol. 2013 Jul 9. [Medline]. Rooke GA, Freund PR, Jacobson AF. Hemodynamic response and change in organ blood volume during spinal anesthesia in elderly men with cardiac disease. Anesth Analg. 1997 Jul. 85(1):99-105. [Medline]. Liu SS, McDonald SB. Current issues in spinal anesthesia. Anesthesiology. 2001 May. 94(5):888-906. [Medline]. El-Hakeem EE, Kaki AM, Almazrooa AA, Al-Mansouri NM, Alhashemi JA. Effects of sitting up for five minutes versus immediately lying down after spinal anesthesia for Cesarean delivery on fluid and ephedrine requirement; a randomized trial. Can J Anaesth. 2011 Dec. 58(12):1083-1089. [Medline]. Carpenter RL, Caplan RA, Brown DL, Stephenson C, Wu R. Incidence and risk factors for side effects of spinal anesthesia. Anesthesiology. 1992 Jun. 76(6):906-16. [Medline]. Ben-David B, Vaida S, Gaitini L. The influence of high spinal anesthesia on sensitivity to midazolam sedation. Anesth Analg. 1995 Sep. 81(3):525-8. [Medline]. Gabrielli A, O’Connor, Maccioli G. Anesthesia Advanced Cardiac Life Support. American Society of Anesthesiologists 2008. www.asahq.org/. Available at http://www.asahq.org/. Accessed: August 4, 2011. Safa-Tisseront V, Thormann F, Malassiné P, et al. Effectiveness of epidural blood patch in the management of post-dural puncture headache. Anesthesiology. 2001 Aug. 95(2):334-9. [Medline]. Horlocker TT, Wedel DJ, Rowlingson JC, Enneking FK, Kopp SL, Benzon HT. Regional anesthesia in the patient receiving antithrombotic or thrombolytic therapy: American Society of Regional Anesthesia and Pain Medicine Evidence-Based Guidelines (Third Edition). Reg Anesth Pain Med. 2010 Jan-Feb. 35(1):64-101. [Medline]. Zaric D, Christiansen C, Pace NL, Punjasawadwong Y. Transient neurologic symptoms after spinal anesthesia with lidocaine versus other local anesthetics: a systematic review of randomized, controlled trials. Anesth Analg. 2005 Jun. 100(6):1811-6. [Medline]. Heng Sia AT, Tan KH, Sng BL, Lim Y, Chan ES, Siddiqui FJ. Hyperbaric versus plain bupivacaine for spinal anesthesia for cesarean delivery. Anesth Analg. 2015 Jan. 120 (1):132-40. [Medline]. The patient's back has been sterilely prepared with betadine, draped with a sterile eye sheet, and the skin and subcutaneous tissues anesthetized with 1% lidocaine. A syringe with the chosen spinal local anesthetic is attached to the spinal needle. Placement within the subarachnoid space is confirmed by gently aspirating cerebrospinal fluid, which appears as a fluid swirl within the syringe. The practitioner will anchor their hand against the back to prevent displacement of the needle during the injection phase.